Poor leaflet content is hardly news when it comes to the output from Southend West’s Tories, but I struggle to recall anything as bad as the latest offering from their Westborough team. It is beyond awful; frankly it is embarrassing. It so poor I take delight in reproducing both sides here. Quite how their candidate can call himself competent after authoring this is beyond me. Mr Peagram likes to dish out slurs. His descriptions of Southend Labour include Old Labour and hard left. Clearly he has not met many of us. The Joint Administration is variously described as: socialist, coalition of the unpopular, communist, left-wing. Again, Mr Peagram’s knowledge of the members who make up the JA is woeful. Daryl’s idiotic spending plans include reinstating a five-day a week rubbish collection, which means scrapping the million plus savings per year. He will reverse cuts to the school improvement budget. He is also opposed to assisting local small businesses which employ local people, complaining about the council forwarding grants to a couple of restaurants. I look forward to him explaining where the money for all this is going to come from. Still, since he is the voice of Southend West Conservatives (one of them at least) he handily provides us with enough ammunition against him and his ridiculous party. Someone ought to remind Southend West’s Conservatives that Cllr Velmurugan readily, and often, describes himself as Conservative-minded. The attack on Cllr Anne Jones is so inaccurate as to be almost laughable. Cllr Jones is “not seeking re-election in Kursaal ward after what she did to their vulnerable kids.” Quite frankly, I’d be embarrassed to be in the same party as Peagram. Daryl states that the “Conservative are the largest party in the UK & Southend“. Wrong on both counts. 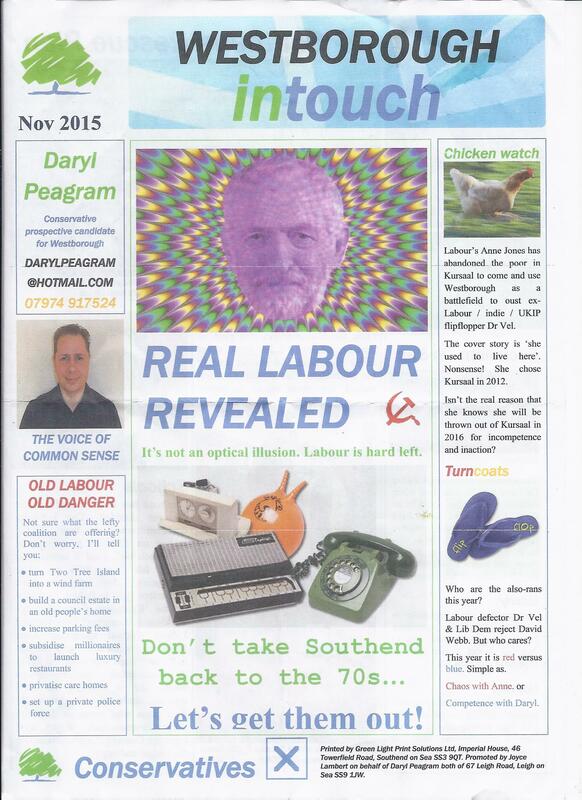 That they accept someone as delusional as Daryl merely highlights just how desperate the Tories are in Southend West. I could almost applaud this drivel insofar as it does nothing for the Conservative cause. I do not because it actually demeans politics. If Mr Peagram survives as the Tory candidate until May I will only presume that any semblance of quality control for their candidates has been abandoned. When it comes to leaflets I have a soft spot for the unusual. Whilst there is much to be said for a consistent look and feel (if nothing else, the average lifespan of leaflet is the length of the walk from the front door to recycling bin, so any impact has to be immediate), but I like to see creativity. Where creativity is unwanted, though, is in the text. Political literature should be honest. Denis Garne, the Conservative hopeful in Victoria ward, has an interesting leaflet. I refer to the design, of course, although interesting may also be applied to what he writes. Headed ‘Neglect and Extravagance’ he begins thus: Residents of certain parts of our town will know all too well how it is to live in neglected areas. There is nothing I could disagree with there; I have long campaigned about the huge inequalities on show across the borough. Mr Garne then goes on to lambast the current administration, whose grip on the council chamber has yet to see its second birthday. Now, as Cllr Garne (as he was at one point) could be argued to have had a hand in how the town was run (although as a then Labour councillor he would have been in Opposition). But he will know that the borough for the vast majority of the years of its existence, and certainly in recent times, has been run by the Conservative Party. Any fault regarding neglect can be fairly and squarely laid at their door. He reports about spending plans, either ignorant or choosing to ignore his party’s lavish expenditure, and profligate waste. Mr Garne also criticises the current trio of Victoria councillors for not living in the ward, failing to point out that neither does he. At least all of the Labour councillors in the borough actually reside in the borough, which cannot be said for his party. To use a word frequently touted by my friend from West Shoebury, Cllr Cox, there is a hint of hypocrisy here. Estimable blogger Matt Dent describes Cllr Jonathan Garston as a lonely figure in Milton ward. It is not a description I entirely agree with as Jonathan managed to find an impressive number of Tories in May to give him another four years. Of course, special thanks was doubtless also given to Vida Mansfield, whose idea of progressive politics must include hobbling Labour’s chances of defeating the Tories in this marginal ward. Garsty includes at least one Milton resident as his friend. Gavin Chambers (Cllr Chambers to give him his formal title) is a man aghast at the temerity of the homeless to be homeless. So appalled is this Milton resident that he is tempted by the delights of Leigh. Hang on though, is he a Milton resident? He shows Loughton as his address on the Epping Forest District Council website. Mind you, perhaps he is as confused about his home address as he is about his politics. After all, this one time Liberal Democrat went Indie before seeking comfort in the bosom of the Conservative Party. Of course, Cllr Chambers might consider looking into the policies of a Government that has seen homelessness increase under its watch. Compared to previous endeavours, the latest from St Laurence’s Tory twosome is a masterpiece. The is not to applaud the combined efforts of Buckley and Flewitt – it merely emphasises just how dire the Tory output from that corner of Southend has been in recent years. It now appears that Trust Links are part of the Conservative ‘St Laurence Action Team’. Not only do their contact details appear under this title on page four of this leaflet, Matt King is now proudly endorsing them. I have yet to politicise any community group in my Milton literature. Not shy when it comes to claiming credit when it is not due them, the Tories in St Laurence ward are making all sorts of noises as regards to the St Laurence Orchard. However, I fear that they are twenty years late in claiming success; Labour’s Reg Copley was the chief instigator in preserving trees in this area. This can be added to a lengthening list of items marked down as ‘misinformation’ by Cllr Flewitt and his coterie. As an aside, they describe the orchard as being in Eastwood. Eastwood is a part of Leigh-on-Sea, and thus has SS9 postcodes. This orchard is in SS2, and therefore has Southend-on-Sea as its postal town. It is not really in Eastwood. It is a minor point, but it is another example of a Flewitt inaccuracy. 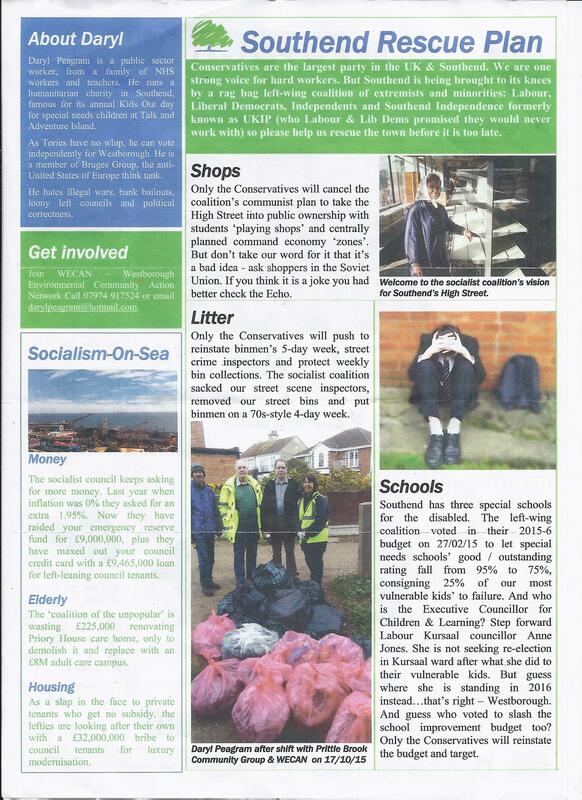 The latest instalment of Cllr Courtenay’s intermittent newsletters hit my doormat recently. Judging by the quality of this one I can fully understand why these are not a regular feature of the political year in Blenheim Park ward. James expresses his delight at his re-election “with a significantly increased majority“. “I hope this reflects the work I have put in….” Whilst I am more than happy to offer my congratulations, I think even James would admit that the coincidence with the General Election was the real reason for his success. He will seek (I presume) a third term in 2019, and I expect a tougher campaign for the Tories then. It looks like Helen Boyd will have a second stab at convincing Blenheim Park residents that she deserves their support. I fully expect that a Labour candidate (possibly Matt Dent looking to continue the good work he has already put in) will succeed next year. Helen will find it difficult going as local elections tend to find those representing the Government party as out of favour. More cuts will be biting by then too, and I expect to see more Tory losses next May in Southend-on-Sea, not gains. 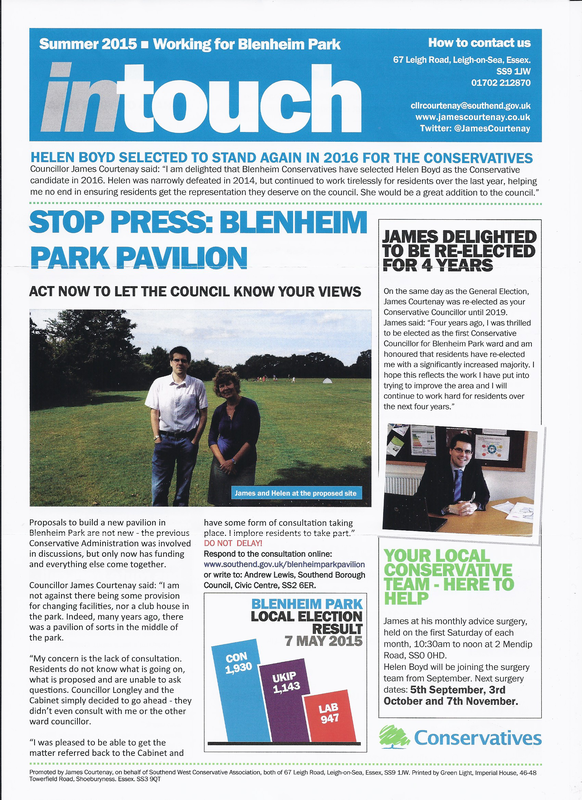 The dominating theme in this leaflet is the proposals for a pavilion in Blenheim Park. Two things strike me. Firstly, whilst I welcome James’s support, the reality is that it was me who proposed referring these proposals back to Cabinet – and James seconded my motion. His article reads like it was all his work, rather than the truth which is that he played a supporting role. The second point I would make is that whilst I am opposed to the plans, James does not appear to share this view. He merely wants to see a proper consultative exercise, and neatly sits on the fence as regards to the actual plans themselves. I invite him to condemn the proposals, or at least clarify where he actually stands in the issue. The unedifying sight of a gloating Prime Minister will surprise those able to take a step back and have a dispassionate look at what happened on May 7th. Let me get one thing out of the way first, it was a night of horrors for Labour. Despite a smattering of successes, we have a problem. That problem is less, in my view, about what happened in April and early May once the starter gun had been fired on the General Election, than about the four-year failure that led to a night of disappointment. It went horribly wrong during the summer of 2010, and never recovered. Perhaps we were naive in thinking that we could be in charge when the biggest recession since the 1920s hit us and could bounce back within five years. We were certainly seemingly unprepared for the sight of wavering Tories returning to the fold when faced with a ballot paper. It was all lost, though, when we failed to defend our record in Government, and allowed a narrative of recklessness to take hold in the collective voter consciousness. However, Mr Cameron needs to remind himself that he sits in number ten with the smallest majority since 1974. He also needs reminding, so it would seem, that his dozen-seat buffer came with a mere 36.9% of the popular vote. Whilst Labour lost big-time in Scotland, this was the Tories fate too; his is a Government of the English by the English. The Conservative success was as much about the fragmenting of the opposition as anything. Labour actually increased its votes share overall, and made fair progress in England – a almost Scottish wipe-out exaggerated just how far behind we fell. Nonetheless, it looks the fracturing on the right largely evaporated, whereas on the centre-left the voters enjoyed the range of options on offer. Cameron will be content with his party’s performance in the midlands and the south; although London remains stubbornly largely red. The north, Wales and Scotland sees isolated pockets of blue. Of course, the reverse is true of Labour, and in my region (East) for instance, our problem is worse than the Tory northern problem. Nonetheless, as victors the Conservatives must expect to be more representative of the UK as a whole. The Conservatives are rightly pleased with their successes, but this success should not be allowed to hide their problems. Faced with an Opposition plumbing new depths in General Election failure, a hung Parliament followed by a small majority seems less like the sort of thing to gloat about, then one to worry about. Labour has a problem, but so do the Tories. Those hoping that Cameron’s dozen majority during the current Parliament will soon evaporate are likely to be disappointed. The table below suggests that by-elections are diminishing in frequency, and besides the incumbent party usually holds on. We have younger MPs, and MPs for whom being an MP is the goal at the end of a career in politics. Whilst Cameron’s majority is twelve, once you take into account the Speaker, Sinn Fein, and friendly parties then his majority likely doubles – and overturning that would require a great many by-elections – more than has been the norm since 1979. I conclude, and this is no genius conclusion, that this Parliament will go full term. The only party who can make it otherwise are the Conservatives themselves – unlikely unless something goes disastrously wrong with that EU referendum.